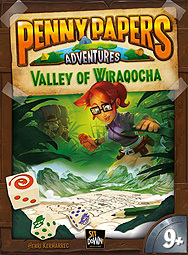 Follow Penny to the heart of the impenetrable Valley of Wiraqocha! Everyone plays at the same time, with the same resources! Each turn, each player tries to place a particular number in their valley to create the best combinations...or to escape the serpents scribbled by the other players!